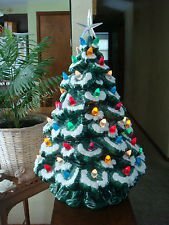 I have never seen a lighted ceramic Christmas tree in person because I had not even ever heard of them until this year while researching holiday decorations. Apparently though there is an interesting history of people using ceramic Xmas trees as a regular part of their decorating because improvements in arts and crafts have led to individuals making beautiful and personalized holiday trees. Now you can purchase one of these lovely handmade crafts even if you don’t have a crafting bone in your body! While doing some research on the ones I liked the best, one repeating theme I saw over and over was that many people say that ceramic trees remind them of their grandparents and Christmas when they were kids. We never used small trees in any of our decorating so I was only used to seeing large real trees with my family. Check out more ceramic options here. 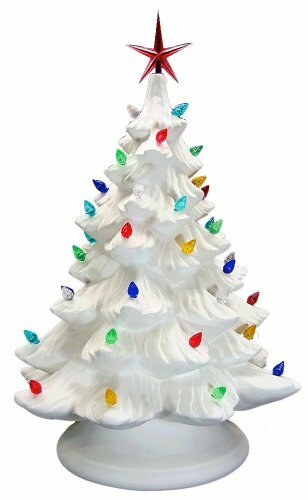 The options I found already come with decorations but if you choose to purchase a plain ceramic tree to decorate and paint yourself, there are also a great variety of ceramic tree ornaments that will help you customize your tree for your tastes. Even some of these pre-lit trees that come with lights and ornaments are still able to be painted if you would like to try a new color. I would go for the white one if that is what you would like to eventually do. My favorite is the third picture of the ceramic Christmas tree with the white ringed branches. I love the overall look of the tree and think it is also the most realistic. With that being said, I know many people will love the feel of the first tree because each tree is handmade which means your tree will be at least a little different than any other tree someone else orders. Like any small tabletop tree, they can be used to decorate almost any place in a house or office. It makes them perfect for gifts for loved ones when you are looking to give away something a little different. Even though they are ceramic which means an unfortunate landing on the ground could cause some damage, I think they would make perfect projects for children who might want to have their own tree. Both my cats are very decoration unfriendly so this is not something I would buy simply because my oldest cat’s favorite game is to knock things off of tables and counter tops. Not sure how well a fragile tree like this would do. I am definitely thinking about buying one of these to give to a friend of mine who wasn’t planning on getting a real tree this year. If she decides to not get one I think this would make a great alternative. Do you like ceramic trees? Did your family use them on a regular basis?